Rome is known for historic sites, sightseeing, museums, nightlife, and shopping. Your plan includes some of its best attractions: steep yourself in history at Colosseum, take in the architecture and atmosphere at St. Peter's Basilica, make a trip to Pantheon, and admire the local landmark of Santa Maria in Trastevere. To find more things to do, reviews, ratings, and more tourist information, you can read our Rome vacation planner. Sydney, Australia to Rome is an approximately 24-hour flight. Traveling from Sydney to Rome, you'll gain 9 hours due to the time zone difference. Traveling from Sydney in December, things will get much colder in Rome: highs are around 16°C and lows about 3°C. Finish your sightseeing early on the 4th (Thu) so you can travel to Lyon. Lyon is a historical city with a vibrant cultural scene as the birthplace of cinema, the silk capital of the globe, and the second biggest Renaissance city following Venice. Kick off your visit on the 4th (Thu): get to know the fascinating history of Vieux Lyon and then meet the residents at Parc de la Tete d'Or. Keep things going the next day: don't miss a visit to Traboules du Vieux Lyon, get to know the fascinating history of Fourviere Hill, and then admire the striking features of Basilique Notre Dame de Fourviere. To see ratings, photos, traveler tips, and more tourist information, go to the Lyon custom trip planner. You can fly from Rome to Lyon in 5 hours. Alternatively, you can take a train; or drive. When traveling from Rome in January, plan for slightly colder days in Lyon, with highs around 7°C, while nights are about the same with lows around 1°C. Cap off your sightseeing on the 6th (Sat) early enough to catch the train to Paris. Change things up with a short trip to Palace of Versailles in Versailles (about 44 minutes away). Next up on the itinerary: enjoy breathtaking views from Eiffel Tower, take in nature's colorful creations at Luxembourg Gardens, examine the collection at Musée d'Orsay, and explore the galleries of Louvre Museum. 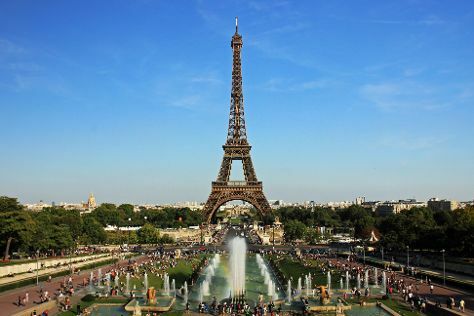 To see more things to do, other places to visit, ratings, and more tourist information, go to the Paris trip itinerary planner. Traveling by train from Lyon to Paris takes 2 hours. Alternatively, you can fly; or drive. January in Paris sees daily highs of 7°C and lows of 1°C at night. On the 11th (Thu), wrap the sightseeing up by early afternoon so you can take a train to Frankfurt. A global center of finance and transportation, Frankfurt is perhaps best known for its futuristic cityscape. On the 12th (Fri), admire the masterpieces at Städel, admire the masterpieces at Liebieghaus Skulpturensammlung, then admire the striking features of Opernturm, and finally admire the natural beauty at Palmengarten. Here are some ideas for day two: admire the landmark architecture of Römer, then contemplate the long history of Frankfurt Goethe House, then contemplate the long history of Messel Pit Fossil Site, and finally take in the views from Eiserner Steg. To see more things to do, reviews, ratings, and tourist information, read Frankfurt trip builder. You can take a train from Paris to Frankfurt in 4 hours. Alternatively, you can fly; or drive. In January, plan for daily highs up to 6°C, and evening lows to 0°C. Finish up your sightseeing early on the 14th (Sun) so you can travel to Potsdam. Formerly an official residence of the Prussian kings, Potsdam is surrounded by a series of interconnected lakes, parks, and palaces. 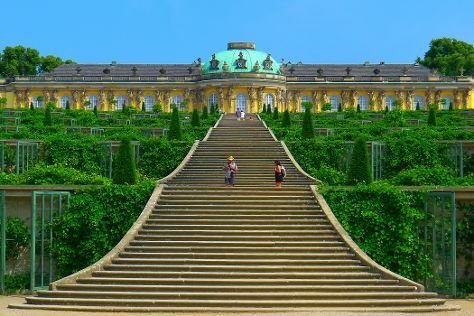 On the 14th (Sun), take in nature's colorful creations at Potsdam's Gardens, then admire the striking features of Sanssouci Palace, and then contemplate the long history of Schloss Cecilienhof. For traveler tips, reviews, maps, and tourist information, go to the Potsdam sightseeing planner. Traveling by combination of flight and train from Frankfurt to Potsdam takes 3.5 hours. Alternatively, you can drive; or take a train. In January in Potsdam, expect temperatures between 3°C during the day and -1°C at night. Wrap up your sightseeing on the 15th (Mon) to allow time to drive to Berlin. Berlin is known for sightseeing, museums, historic sites, nightlife, and parks. Your plan includes some of its best attractions: ponder the world of politics at Reichstag Building, make a trip to East Side Gallery, admire nature's wide array of creatures at Zoo Berlin, and step into the grandiose world of Charlottenburg Palace. For photos, where to stay, maps, and other tourist information, you can read our Berlin online itinerary creator. You can drive from Potsdam to Berlin in an hour. Another option is to take a train. Wrap up your sightseeing on the 19th (Fri) to allow time to travel to Munich. 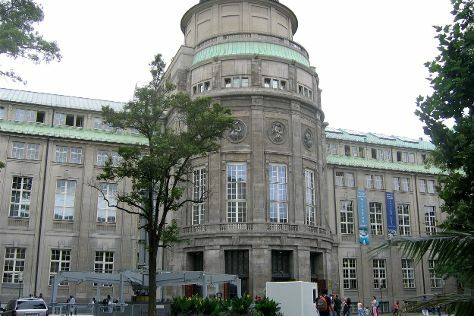 Munich is known for sightseeing, museums, nature, nightlife, and historic sites. Your plan includes some of its best attractions: don't miss a visit to Marienplatz, admire the masterpieces at Alte Pinakothek, admire the striking features of Frauenkirche, and contemplate the long history of St. Peter's Church. To see more things to do, traveler tips, where to stay, and more tourist information, go to the Munich itinerary builder. Traveling by flight from Berlin to Munich takes 3.5 hours. Alternatively, you can drive; or take a train. In January, plan for daily highs up to 3°C, and evening lows to -3°C. Wrap up your sightseeing by early afternoon on the 24th (Wed) to allow time for travel back home.